The House Sparrow is about as ubiquitous as birds come: It boasts the broadest distribution of any wild bird, though much of that geography it’s only relatively recently come to occupy thanks to intentional releases by human beings and rapid, opportunistic colonization of human-dominated habitats. It’s likely the most numerous bird today in North America, where it isn’t native, and in some cases its aggressive occupation of nest boxes and general proliferation have negatively affected native species such as Eastern Bluebirds. The House Sparrow is a member of the Old World sparrow family, Passeridae, and thus isn’t closely related to native American sparrows (Family Passerellidae). In form it’s stockier, bigger-headed, heavier-billed, and shorter-tailed than a typical American sparrow. In its most urban haunts it’s likely to be the only sparrow on the scene, further limiting I.D. confusion. This roughly 1-oz. sparrow is typically about 6 or 6.5 inches long with a wingspan of 8 or 9 inches or so. In his Sibley Guide to Birds, David Allen Sibley notes that House Sparrows in their adopted North American range have begun showing regional variations: Northern birds tend to be bigger than southern ones, and Southwestern sparrows have paler plumage than their Pacific and Eastern counterparts. 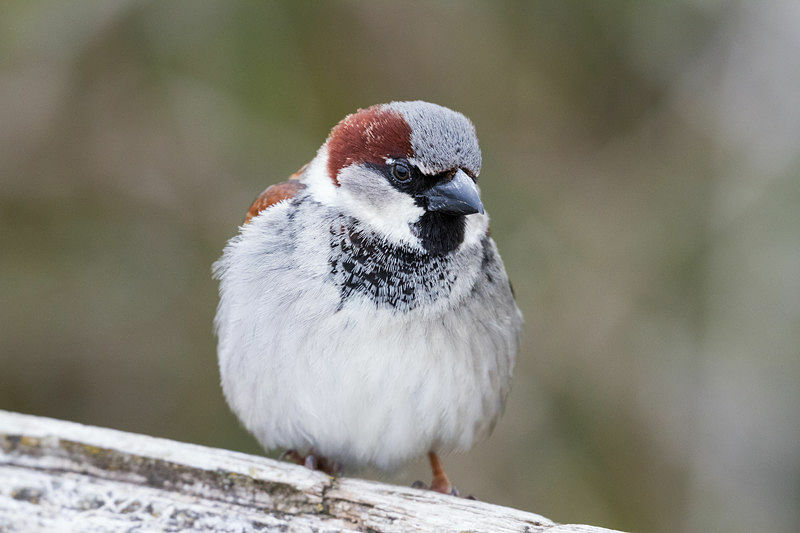 The male House Sparrow in breeding getup is richly colored and patterned: a black-streaked chestnut back, a chestnut nape, and a black mask, bill, throat, and bib. Outside the breeding season, the male is slightly less striking, the chestnut fading from the nape and the black from the bib. Breeding males have a black bill, while non-breeding males have a yellowish one. Male House Sparrows are unlikely to be confused with any other bird except for the roughly similarly patterned Eurasian Tree Sparrow, which is much more restricted in range (mainly found around St. Louis, Missouri) and is also smaller, lighter-billed, and sporting a black cheek mark that the male House Sparrow lacks. Female House Sparrows have a brown-and-black-streaked back and a brownish gray breast without the black eye mask or throat of the male. The House Sparrow first came to North America in 1851, when this Eurasian and North African native was intentionally released in New York City in an attempt to control the spread of the linden moth, which was infesting many urban trees there. The bird spread rapidly from that beachhead, the population boosted by a few other intentional releases in the late 19th century, including in the West. Today, the range of the House Sparrow encompasses the entirety of the Lower 48 states as well as much of Canada outside the Arctic (they’re mostly absent from Alaska). Within that range, however, they’re basically restricted to cities, towns, farms, and other settled landscapes. These certainly aren’t wilderness birds, and basically they aren’t countryside birds either except around grain fields and outposts of man-made infrastructure. To put things in context – which seems warranted given this species’ status as the most widespread bird in the world – the House Sparrow has also spread into Mexico, Central America, and the southern part of South America, plus Australia, New Zealand, parts of sub-Saharan Africa, and many islands. Given their cosmopolitan range and urban visibility, we tend to think of House Sparrows as a dime a dozen. They’re certainly majorly abundant, but populations in the eastern U.S. and many other parts of its colonized range have actually been on the ebb for some time. The House Sparrow is primarily a seed-eater, consuming the seeds of grasses, cultivated grains, and weeds. In summer, it also feeds heavily on insects, which are important food (and moisture) for nestlings. These street-smart sparrows also forage among garbage and other leftovers. They tend to seek out food on the ground, but will also glean for insects in trees and from the grills of cars, and occasionally catch them in flight. The simple (and noisy) chirps, cheeps, and chatters of the House Sparrow are omnipresent in many urban and suburban soundscapes. The song, mostly uttered by males and not confined to the breeding season, is essentially just a chirp, or a series of them. You can listen to examples of the House Sparrow call song here. The male House Sparrow chirps and fluffs out his breast, splays his wings, and raises his tail while hopping about to show off for females in the vicinity. These sparrows nest in cavities and crevices on building walls, gutters, rooftops, streetlights, and other infrastructure (including indoor spaces) as well as in tree cavities and birdhouses; they may kick out Eastern Bluebirds, Tree Swallows, and other birds from their cavity nests and take them over. In the same feisty vein, House Sparrows aggressively defend their nesting sites from other birds. Clutch size ranges between about two to eight eggs; there are commonly two or three broods in a season. Both male and female sparrow incubate the eggs for 10 to 14 days, and young remain in the nest for about the same period. Cornell Lab of Ornithology. All About Birds: House Sparrow. National Audubon Society. Guide to North American Birds: House Sparrow. Parsons, Ian. 7 March 2018. “House Sparrow.”Bird Watching. Hey Buddy!, I found this information for you: "The House Sparrow". Here is the website link: http://backyardbirdingblog.com/house-sparrow/. Thank you.